In a back room at CES, Samsung Displays was giving a select group of media members a look at their upcoming display lineup. At the front of it all was their curved Youm display, which drew “Oohs” and “Awws” during the Samsung keynote, but that may not actually be the biggest story to come out of this back alley hangout. 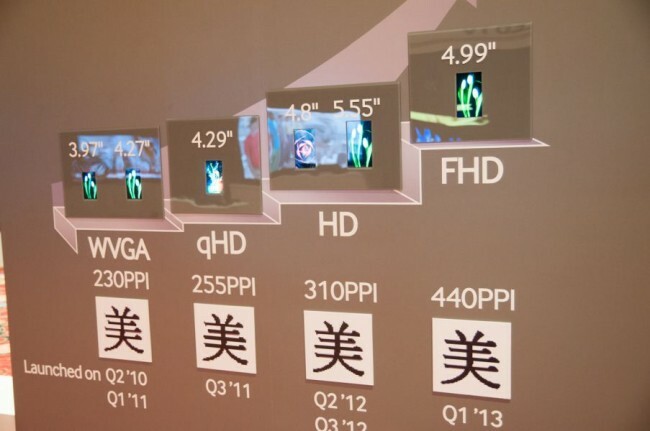 On one of the walls was a roadmap that may have given us a hint as to what the Galaxy S4 display will be like. If you look first at the third slot from the left in the image above, the one showing a 4.8″ and 5.55″ HD display, one would assume this is for the Galaxy S3 and Galaxy Note 2. Since those are the exact displays that each of those devices contained, it’s not a stretch by any means. But what comes next in the roadmap is what we care about. See that slot that mentions an “FHD” 4.99″ display? That would be a 4.99″ 1080p display with 440ppi and an availability of Q1 2013. Now this may be somewhat of a stretch, but how can we not assume that this is the display that will be in the Galaxy S4? According to this roadmap, there isn’t anything else on the way other than this display. We also would imagine that Samsung would go 1080p on the next phone, since everyone else in the game is going that route. Little else is known about the Galaxy S4, however, we have already seen some suggest that we could get the new Exynos Octa 8-core processor in it. That’s a bit of stretch.